In 2007, INEGI census recorded 2.4 million “units of production” (farms) under 2 hectares in size. This number is 43.5% of all farms, and includes farms not being actively worked. 22.9% of farms were between 2 and 5 hectares in area and a further 23.4% between 5 and 20 hectares. In sum, almost 90% of all farms had an area of 20 hectares or less. At the other end of the size spectrum, 2.2% of farms were larger than 100 hectares. In terms of land tenure, 68.5% of all farms were in ejidos (a form of collective farming), 28.5% held privately and the remaining 3% were other (communal, public, mixed). Almost three-quarters of all farms under 20 hectares in area are ejidos, whereas about three-quarters of all farms over 100 hectares in size are private. The choropleth map (above) shows the average size of farms (in hectares) by state. 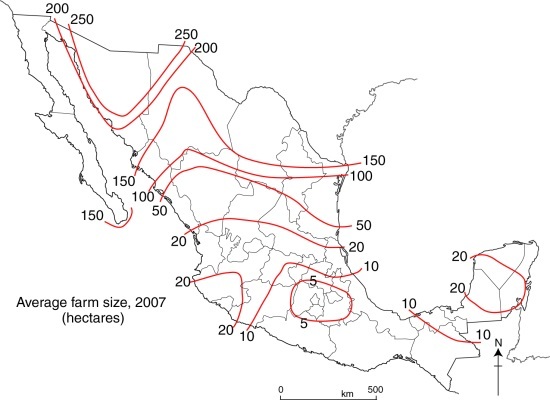 It is very clear that larger farms are concentrated in northern Mexico. All the states along the US border have average farm sizes in excess of 100 hectares. At the other extreme, a ring of states in central Mexico (centered on the Federal District) have average farm sizes that are below 5 hectares. The average farm size is slightly larger to the south of that ring of tiny farms, and significantly larger towards the east, including those states comprising the Yucatán Peninsula. The general pattern is of a north-south division, which becomes even clearer when the average farm sizes are plotted as an isoline map. With minor exceptions, the “surface” represented by these isolines slopes steeply away form the highest values in north-western Mexico towards the south-east. Having recognized this pattern in farm sizes, can you think of reasons that might explain it? The short answer is that farm sizes vary in response to a multitude of factors, These include historical, demographic, and socioeconomic factors as well as relief, climate, natural vegetation and soils. Q1. Compare the maps in this post with maps for some of the factors you think might be important. (Try our Geo-Mexico Map Index as a starting point). For example, the northern area of Mexico, the area with largest farms, is primarily semi-arid or arid. Why might farms in arid and semi-arid areas be larger than in other areas? Q2. Have a class discussion about the relative importance of the factors that have been identified or suggested. Q3. Discuss the relative merits of the two mapping methods used in this post (choropleth and isoline) to portray average farm sizes.